There was what President Obama likes to call a teachable moment last week, when the International Olympic Committee rejected Chicago’s bid to be host of the 2016 Summer Games. “Cheers erupted” at the headquarters of the conservative Weekly Standard, according to a blog post by a member of the magazine’s staff, with the headline “Obama loses! Obama loses!” Rush Limbaugh declared himself “gleeful.” “World Rejects Obama,” gloated the Drudge Report. And so on. So what did we learn from this moment? For one thing, we learned that the modern conservative movement, which dominates the modern Republican Party, has the emotional maturity of a bratty 13-year-old. But more important, the episode illustrated an essential truth about the state of American politics: at this point, the guiding principle of one of our nation’s two great political parties is spite pure and simple. If Republicans think something might be good for the president, they’re against it -- whether or not it’s good for America. To be sure, while celebrating America’s rebuff by the Olympic Committee was puerile, it didn’t do any real harm. But the same principle of spite has determined Republican positions on more serious matters, with potentially serious consequences -- in particular, in the debate over health care reform. Now, it’s understandable that many Republicans oppose Democratic plans to extend insurance coverage -- just as most Democrats opposed President Bush’s attempt to convert Social Security into a sort of giant 401(k). The two parties do, after all, have different philosophies about the appropriate role of government. But the tactics of the two parties have been different. In 2005, when Democrats campaigned against Social Security privatization, their arguments were consistent with their underlying ideology: they argued that replacing guaranteed benefits with private accounts would expose retirees to too much risk. The Republican campaign against health care reform, by contrast, has shown no such consistency. For the main G.O.P. line of attack is the claim -- based mainly on lies about death panels and so on -- that reform will undermine Medicare. And this line of attack is utterly at odds both with the party’s traditions and with what conservatives claim to believe. Think about just how bizarre it is for Republicans to position themselves as the defenders of unrestricted Medicare spending. First of all, the modern G.O.P. considers itself the party of Ronald Reagan -- and Reagan was a fierce opponent of Medicare’s creation, warning that it would destroy American freedom. (Honest.) In the 1990s, Newt Gingrich tried to force drastic cuts in Medicare financing. And in recent years, Republicans have repeatedly decried the growth in entitlement spending -- growth that is largely driven by rising health care costs. But the Obama administration’s plan to expand coverage relies in part on savings from Medicare. And since the G.O.P. opposes anything that might be good for Mr. Obama, it has become the passionate defender of ineffective medical procedures and overpayments to insurance companies. How did one of our great political parties become so ruthless, so willing to embrace scorched-earth tactics even if so doing undermines the ability of any future administration to govern? The key point is that ever since the Reagan years, the Republican Party has been dominated by radicals -- ideologues and/or apparatchiks who, at a fundamental level, do not accept anyone else’s right to govern. Anyone surprised by the venomous, over-the-top opposition to Mr. Obama must have forgotten the Clinton years. Remember when Rush Limbaugh suggested that Hillary Clinton was a party to murder? When Newt Gingrich shut down the federal government in an attempt to bully Bill Clinton into accepting those Medicare cuts? And let’s not even talk about the impeachment saga. The only difference now is that the G.O.P. is in a weaker position, having lost control not just of Congress but, to a large extent, of the terms of debate. The public no longer buys conservative ideology the way it used to; the old attacks on Big Government and paeans to the magic of the marketplace have lost their resonance. Yet conservatives retain their belief that they, and only they, should govern. The result has been a cynical, ends-justify-the-means approach. Hastening the day when the rightful governing party returns to power is all that matters, so the G.O.P. will seize any club at hand with which to beat the current administration. It’s an ugly picture. But it’s the truth. And it’s a truth anyone trying to find solutions to America’s real problems has to understand. A version of this article appeared in print on October 5, 2009, on page A23 of the New York edition. After there was such vitriol over the President speaking to schoolchildren, mentally I've completely given up on hopes of any form of respectful debate or cooperation on finding solutions to problems. 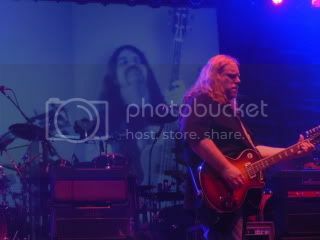 Lovin my Duane Allman music....everyday jamin' for Duane. unfortunately, i agree with most of the article. 2 - what krugman and other's fail to do is realize that the conservative moment is not led by rush and drudge. it's lead by real thinkers that most people do not care to consider. krugman would offer a lot more of an independent opinion if he chose not to rely on rush and drudge as his muses. This is a new level. People don't want the President to speak to their children? He's an "enemy of humanity?" I'm sorry, but who exactly are these real thinkers, and why is it everyone else's fault that no one knows who they are? None of those "real thinkers" seem to have any issue with what anyone on their side of the fence says or does. Why is that? That makes absolutely and unequivically no sense at all. So, what would you like to see happen to Chicago? Blown up? Thrown out of the Union? Everyone executed as Traitors from Obamaland? Exactly. I gave up long before you though simply for the extreme depths of ridiculousness that the Right is going to. Missing- 245 spines. If found, please send one to 1600 Pennsylvania Ave and the rest to the Capitol building care of the Democratic Party. Given the general negative disposition it may be difficult to salvage the republican party. If memory serves, Jerry tried to return a jacket with the reason being spite. The clothing store refused as they determined it was not a valid reason. There's a lot of truth is this piece by Krugman. And I agree that it is getting worse. I think the game changed when the Clintons were in the White House. They were deeply hated by many people in this country, and we saw the result. The Republicans impeached Bill Clinton, just a few years after one of their heroes secretly sold weapons to one of our enemies. I think that is what really took the division between the two parties to a new level. Then 8 years of lying, war-mongering George W. Bush, and now this vicious, sustained attack on Obama from the right, which started long before he took office. Couple all that with an internet age where information is almost instantaneous, and who knows where all this animosity might lead. It really would be nice if some influential Republicans got together, and tried to get their party back on course again. It should be pretty easy pickins for the right people. Newt Gingrich comes to mind. I don't like him or have much respect for him, but he is smart enough to see an opening for a cooler head. Couple all that with an internet age where information is almost instantaneous, and who knows where all this animosity might lead. I tried to return it because it didn't fit. The clerk told me in a spiteful voice "You need to lose weight." All photos posted of family, friends, and places, including those of historic ABB value, by this poster are copyrighted by the poster, or posted by permission of the copywriter. None of those photos may be reproduced for commercial gain. Really! It's not like they were wanting to bring the Olympics to D.C....the place where corruption and grand scale theft have been elevated to an art form. I'm almost to the point where a little reverse psychology might be best. Obama should come out on something like Gitmo and say he's strongly in favor of keeping it open. The party of no then says he's wrong, close it. Obama then says "as you wish." The thing about the death panels is a perfect example of how foolish the opposition looks. They were once the party of fiscal restraint, right? So how did they get to a place where their greatest opposition to healthcare is that it does not impose on the treasury unlimited exposure to continue funding lifesaving procedures (of course I'm assuming for the sake of argument there would be such panels)? A private insurer can have contractual lifetime limits of liability, because it can't be expected to bankrupt itself. Why should the GOP insist that gov't bankrupt itself to extend lives that may not contine much longer anyway? I first realized the irrationality of the Obama can do no right gang when our own bumpersticker poster criticized his handling of the pirate hostage situation. Especially when the Pres ordered the cutting down of one of his fellow Muslims! Alfred Knopf puts out a novel about killing George W. Bush. A movie with the same plot wins a prize at the Toronto Film Festival. Howard Dean brags "I hate Republicans". The New Republic puts out a piece entitled" Why I Hate George W. Bush"
Fortunately Ted Kennedy, Nancy Pelosi and Harry Reid all got together with young Senator Barack Obama and held a press conference denouncing the politics of spite. You remember that. Don't you? That's so not even comparable that it's unworthy of comment. So was it wrong then, and is it wrong now? I also vividly remember a majority of the Right thinking that the opposition was made up of traitors who hate their country. Probably still do. Nothing wrong with that, though, I'm sure? The Right just ramped it up to the next level, but you smugly refuse to even consider that. On it goes. VP Burr killed Hamilton. What's the next level up from that? A" majority of the right thinking". How do you know that? Or is it kind of like Jeeeemy's mind reading? I'm quite willing to say birthers now and "Bill and Hill had Vince Foster killed" types were nuts then and nuts now. Do you think 9/11 Troofers deserve a serious hearing? I had to much respect for you to ask that when you asked me if I thought birthers were nuts. Given the current state of affairs, I shudder to even consider it. A" majority of the right thinking". How do you know that? As far as how I know that, I have eyes and ears. Plenty of those on the Right said it, and if there were others on the Right that didn't think that, they certainly never said a word to the contrary. Just like now, as a matter of fact. Or is it kind of like Jeeeemy's mind reading? I don't even know what that means. Do you think 9/11 Troofers deserve a serious hearing? Of course not. But, you're swerving way off course from the original point of the Krugman piece. It was wrong then and it is wrong now. But the problem is Democrats only condemn Republicans and vice versa. There is NO civility left and it is not the fault of one side or another. "As far as how I know that, I have eyes and ears. Plenty of those on the Right said it, and if there were others on the Right that didn't think that, they certainly never said a word to the contrary. Just like now, as a matter of fact." I have eyes and ears, but I don't "know" that. As far as never saying a word to the contrary, are there any instances of Krugman decrying any of the numerous examples of prominent speakers on the left who went off the rails? To narrow the focus down, let's try when the chair of the DNC(Dean) said " I hate Republicans"
Obama is a terrorist sympathizer. Obama isn't an American citizen. Obama is a racist who hates white people. Obama is a Socialist who wants to destroy our way of life. Obama is a Fascist who wants to destroy our way of life. Obama is a Communist who want to destroy our way of life. Obama is the next incarnation of Hitler. Obama is the next incarnation of Stalin. That's what my eyes and ears have seen and heard. Sorry if I'm not outraged at Dean's comment. Oh, I forgot, Obama is an enemy of humanity.